Once you hear Jason, you’ll understand why this internationally published classical music and audiophile critic chose his name, Serinus, for the genus of songbirds that includes canaries. In the world of musical whistlers, JVS stands out. After all, he whistled Puccini as the Voice of Woodstock, the Peanuts gang’s favorite little bird, in the internationally televised, Emmy-nominated Peanuts cartoon, She’s a Good Skate, Charlie Brown. After winning multiple awards and serving as a judge at whistling competitions, “the Pavarotti of Pucker” was inducted into the Whistler’s Hall of Fame in 2003. He has also performed in commercials, whistled on the soundtrack of Reindeer Games, and survived the skepticism of David Letterman on The Tonight Show. If you think that whistling is solely for calling pets, invoking “Dixie,” and blasting approval at sporting events, come see what can be done by someone who takes his artistry seriously while maintaining a healthy sense of humor. Now that he lives in the area, Jason has also joined in the fun of benefit shows for the New Old Time Chautauqua. 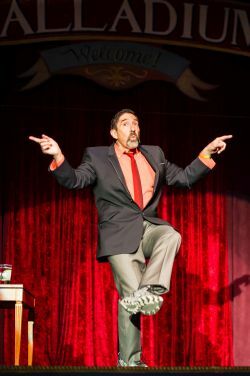 He delighted and amazed Moisture Festival audiences when we had him here in past years and we are delighted to have him back in 2019.